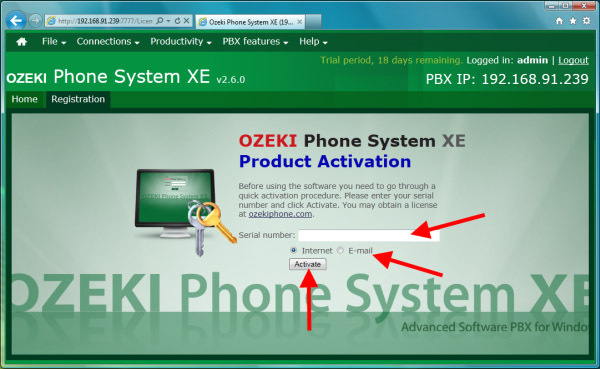 The following guide explains how you can activate the purchased Ozeki Phone System XE software license in order to start using its full version without any limitations. To be able to use Ozeki Phone System XE software without any limitation, you need to purchase and activate an Ozeki Phone System XE software license. After purchasing an Ozeki Phone System XE software license, you obtain a license key from Ozeki Informatics Ltd. that can be used to activate the purchased software license. Note, that you can freely download and install the trial version of the software from the download page. It does not require any kind of activation to use the software in trial mode. You can activate your Ozeki Phone System XE software license on the Web GUI. First, you need to open it, and enter your username and password (Figure 1). Once you have logged in, go to Help/Registration menu (Figure 2). When you have opened the registration tab, you can enter the username and license key obtained from Ozeki Informatics Ltd. after the purchase of the software license. Before using the software you need to go through a quick activation procedure. Please enter your serial number, choose the Internet or E-mail and click Activate. (Figure 3). After doing the activation procedure, your Ozeki Phone System XE will be registered successfully and you can start to use its full functionality. 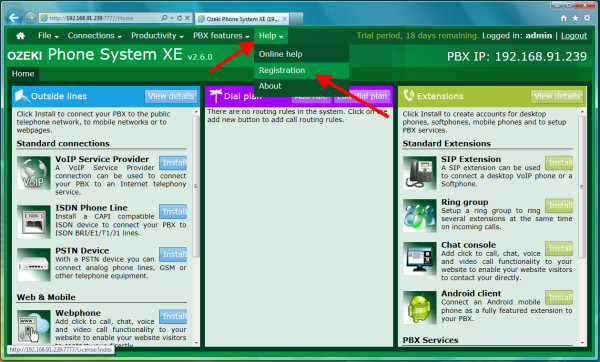 Note: After the registration, you need to restart Ozeki Phone System XE software to work without any limitations.